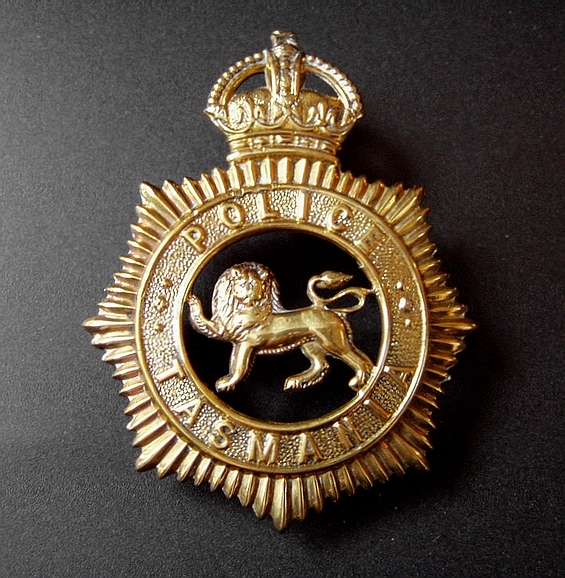 Tasmania Police Force, Municipal Police Forces (including the Hobart City Police and Launceston Police) and Territorial Police (Colonial Police, Field Police and Rural Police) badge history. 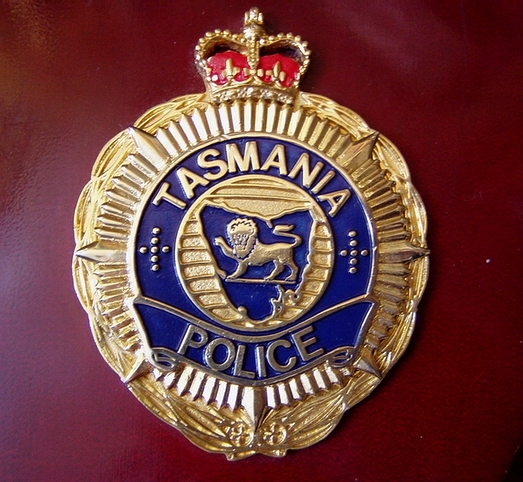 Note: The State arms, seal and name: Tasmania Police are Copyright © State of Tasmania, Australia. The "Hobart City Police" QVC Helmet plates. These was worn by the Hobart Town City Police; the largest of twenty Municipal forces established between 1857 and 1866. These helmet plates were probably introduced in c 1868 and worn until the early 1900's, when this Force became one of the constituent Forces that formed the Tasmania Police Force on January 1st, 1899. Obviously the Queen Victoria crown was added to the later plate. There is also an "Extremely Rare" pinned ,VR cypher version.These plates, the first Launceston Municipal Police helmet plate (second below left) and the beautiful Municipal Police helmet plate (below right) are amongst Australia's oldest official Police badges. Hobart is Australia's second oldest city. Some with slight variations exist. * One of the Rarest. The second version of the "Launceston Police" Helmet plate when it was raised to "City" status. c 1889. It was amalgamated into the Tasmania Police Force during its early formation in 1898/99. Launceston is Australia's third oldest city. The first issue "Launceston Police" Helmet plate. The Launceston Police was probably the first "Municipal" Police force to be formed in Tasmania in 1857. * One of the Rarest. 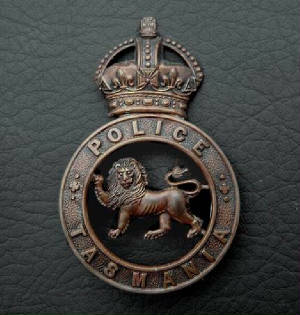 The Tasmania Police King's Crown cap badge, in the chocolate brass version as worn on caps and helmets by early motorcycle officers; also known as "Troopers". JR Gaunt and Sons. c 1939. Extremely Rare. 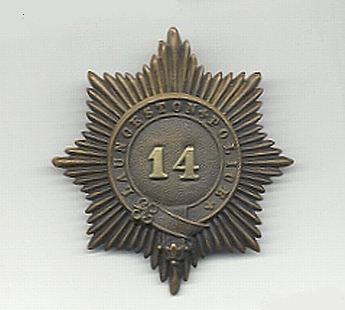 This badge was originally issued in a Rare "blackened brass" version for kepi's and/or "night caps". c 1919. A polished brass version was also issued for day wear on caps. Originally issued for Inspectors only. Extremely Rare. 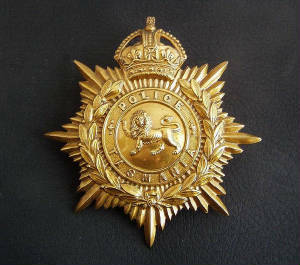 King's Crown brass cap badge issued for "other ranks". Rare. c 1954. The "King's Crown" Tasmania Police chrome Plaid Brooch badge for the Pipe Band; normally worn with red cloth behind the lion. Also in a later "Queen's Crown" chrome version issued c 1975. Replaced in the early 1980s by a "gold" coloured brooch of the same pattern with Queen's Crown and with blue cloth behind the lion. King's Crown is Extremely Rare. Queen's Crown is Very Rare. Special Constable badge probably issued or made for use during WW2. Sterling Silver plated. Hallmarked "Stokes and Sons Melb." and numbered on reverse. Very Rare. Beware of unhalmarked and unnumbered "junk" replica's, not plated with Sterling Silver. * Ozbadge thanks Gordon Maulday, Mike Austin, John and Robyn McCullagh, John Presser and Russ Ames. The Tasmania "Territorial Police" QVC Helmet plate. The Territorial Police were formed in 1865 from the Colonial Police; who evolved in 1855 from the Field/Rural Police (c1825). All these forces had jurisdiction outside the cities and municipalities. Also in a white metal "New Norfolk" version; with the cypher "NN" attached. 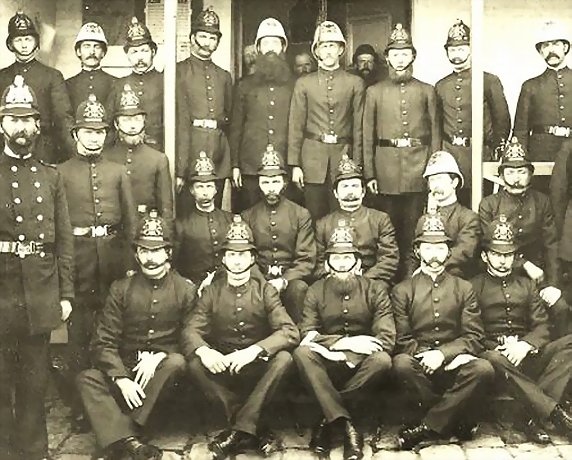 They were all amalgamated into the Tasmania Police force in it's early formation in 1898. Extremely Rare. 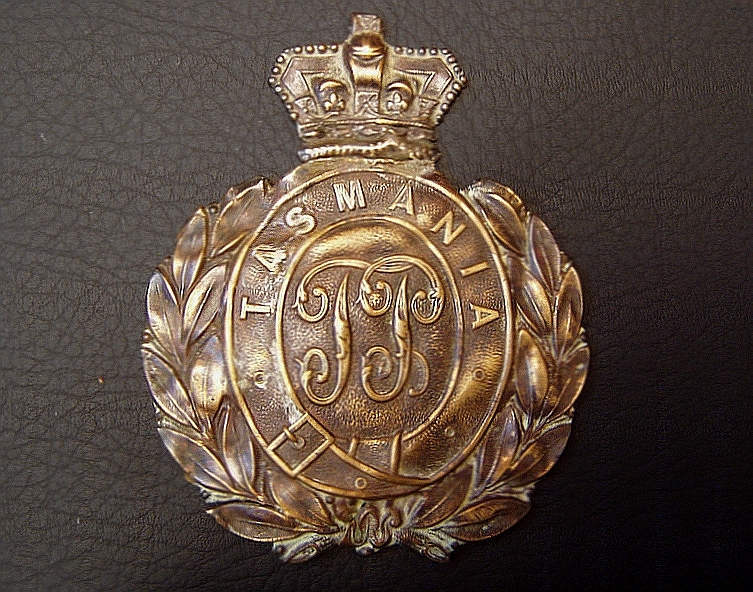 The Tasmania Police King's Crown "Inspector's" cap badge. Some early Extremely Rare versions hallmarked with bug: J.R. Gaunt, London. c 1930 - 1975. Also worn by female Police Officers. Very Rare. Note: Superintendents and above wore a single embroided crown as a cap badge since the late 1800's. Very Rare. 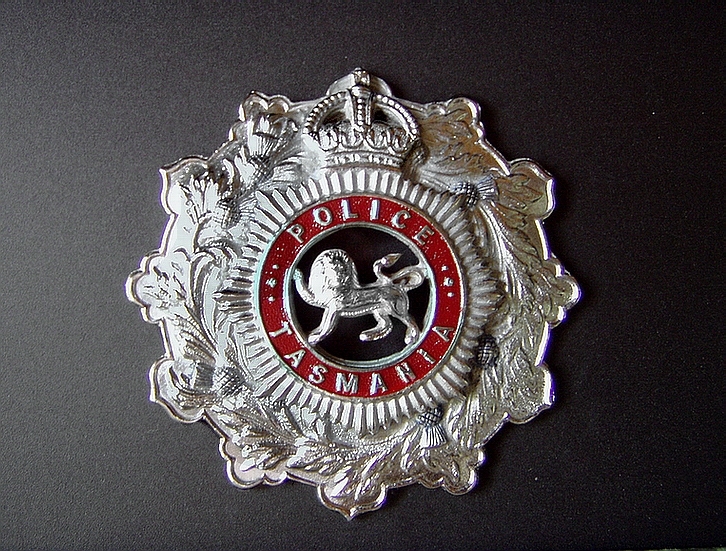 The Tasmania Police King's Crown "chrome" cap badge; as worn by Commissioner Eric Knowles and his Deputy Commissioner in 1976. Also adopted by the Pipe Band for their feather bonnets and glengarries. Very Rare. 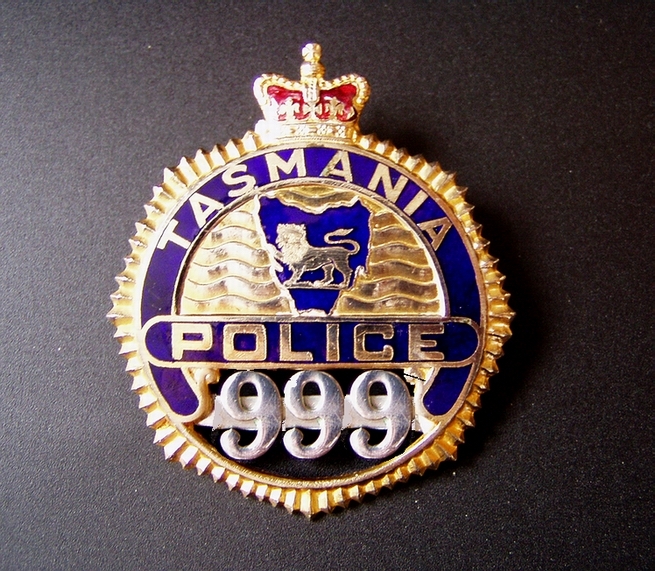 The first numbered Tasmania Police "breast" badge. Made of a light brass alloy metal. Second last issue before current. c 1956 - 1974. Some rare variations also exist in an earlier stamped brass version; without the semi circle of blue enamel. Also in a rare, "T" plus number version, for "Trainee". CIB and plainclothes officers often wore a "pin backed" badge with an East-West brooch fitting. Scarce. 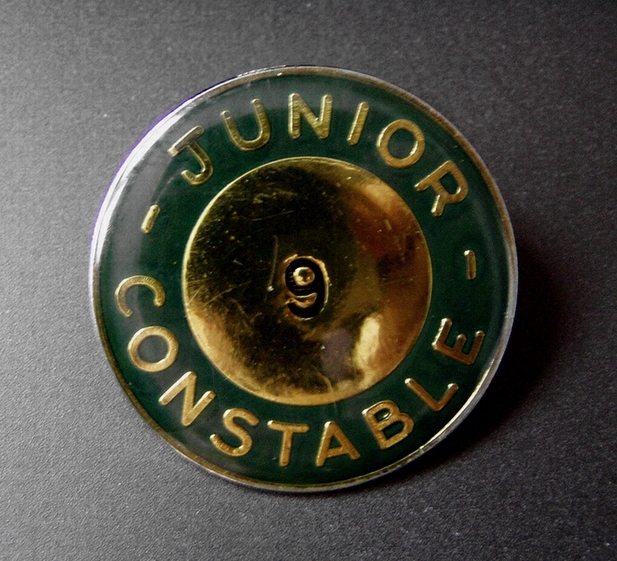 The Junior Constable badge. c 1970. Hallmarked "Stokes". Rare. 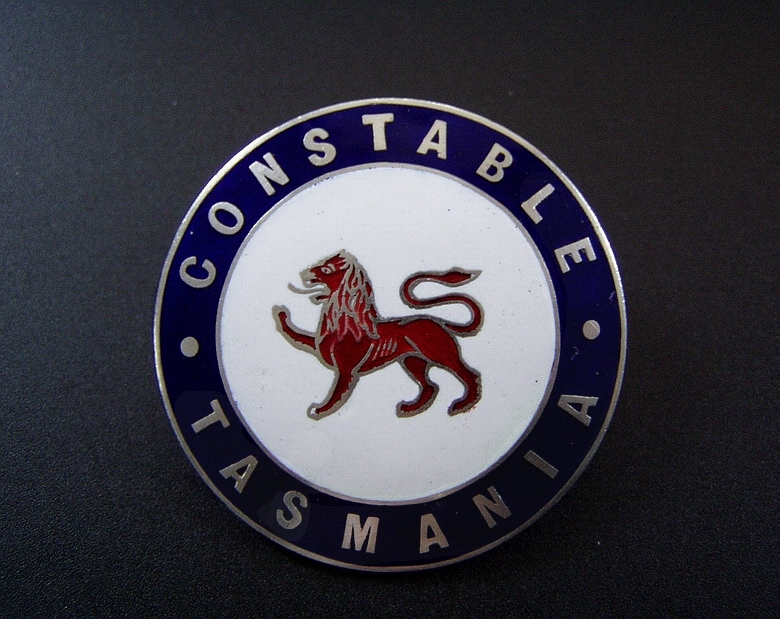 Tasmania Police current style "plaque" badge. 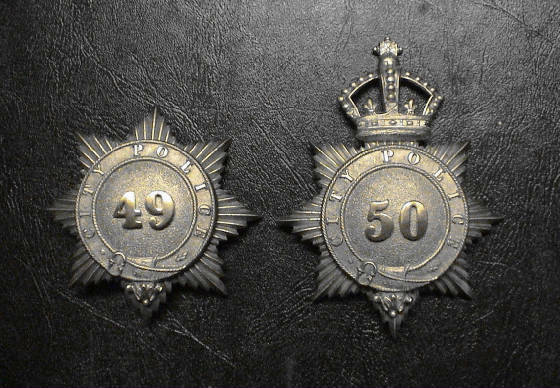 A new style of "numbered" breast badge, a new flat ID badge and also a new cap badge design were introduced in 1978; which were designed by Inspector Russ Ames. A new set of Commissioned Officer's breast badges was also introduced in the same style (but without numbers) with current "Officer" ranks, from Inspector through to Commissioner, engraved in the plinth area. Also issued in versions with either "Pipe Band", "Cadet" , "T" (Trainee) plus a number, "School Based Trainee" or "Junior Constable" engraved in the plinth area; instead of a number. 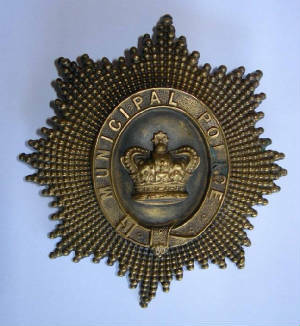 The "Municipal Police" helmet plate used by some of the 19 minor municipal controlled police forces from c 1857 to 1898/9 – Hobart and Launceston had custom made Municipal police badges. Longman & Co London. U.K. * One of the Rarest. 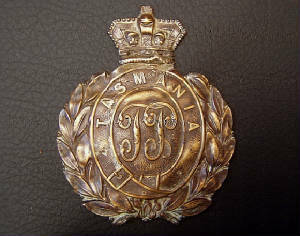 The first "Tasmania Police Force", King's Crown, Helmet plate. 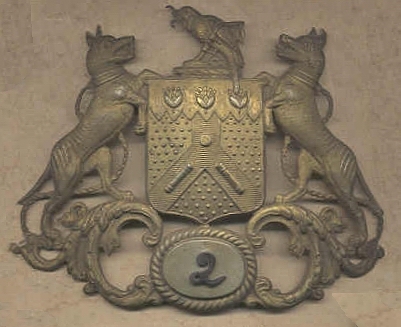 Worn from c 1901 to 1945. Very Rare. 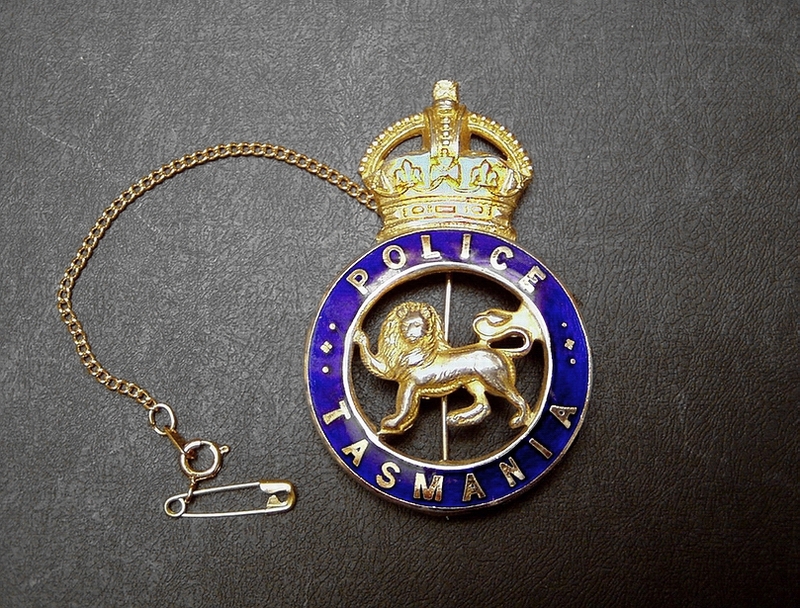 The Tasmania Police King's Crown "Female" Brooch badge; with safety chain. Worn with rank "chevrons" badge underneath. Note: the North-South pin. Some hallmarked with bug: J.R. Gaunt and Sons Ltd, London. Issued c1932 to 1970. Extremely Rare. 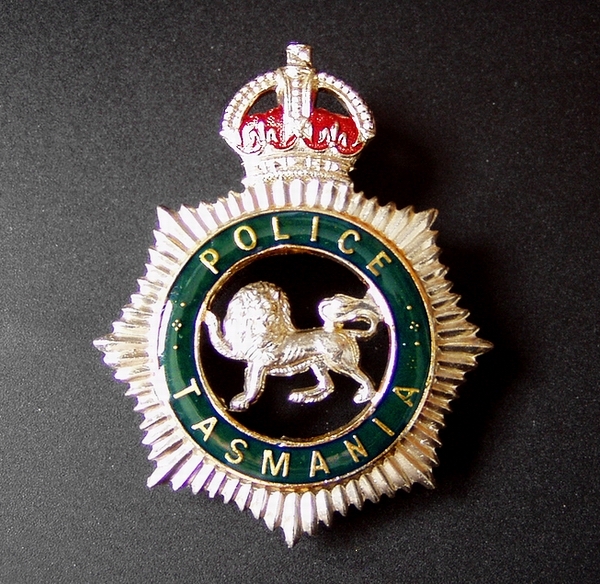 Tasmania Police King's Crown cap badge. Made of anodised metal and epoxy enamel. c 1975. Scarce. 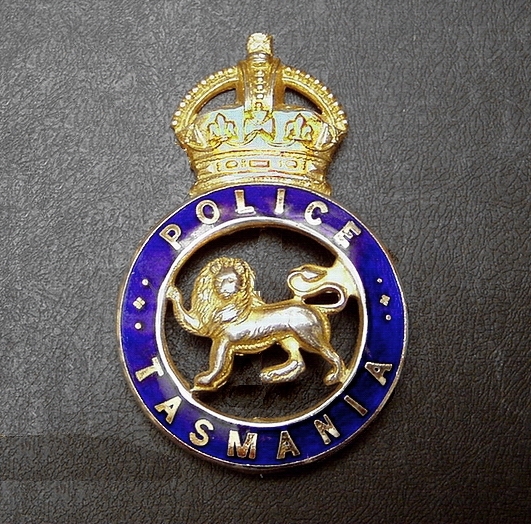 Obsolete Tasmania Police "breast" badge. Made of a light anodised type metal and epoxy enamel. Last issue before current badge c 1974 - 1978. Hallmarked: "Stokes Melb". Scarce. Also in a Rare, "T" for Trainee version. 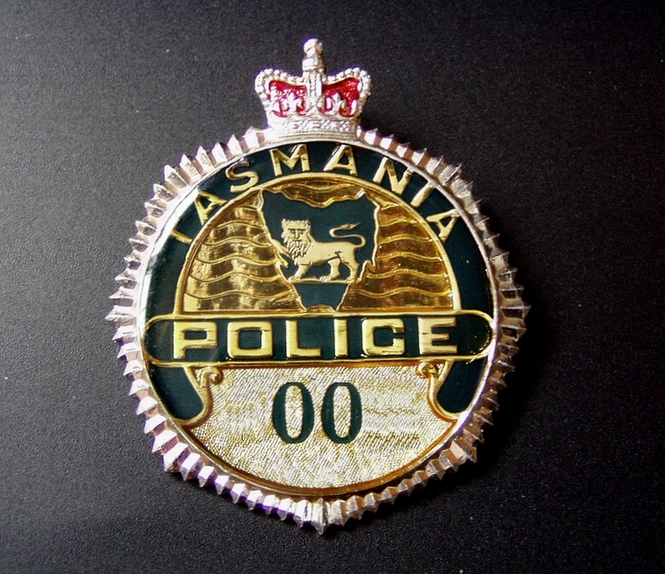 N.B: Tasmania was the first Australian State Police Force to issue a "breast" badge. Some Federal agencies also issue a "fob"style, breast badge (A.C.T., A.F.P. and Customs). 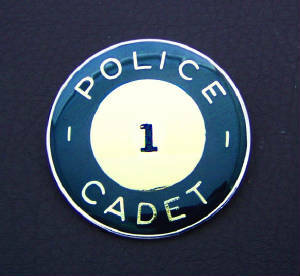 The Police Cadet badge. c 1970. Hallmarked "Stokes". Rare.